Most small businesses fail within the first five years of operations. PUSH the Envelope™ was not among them. 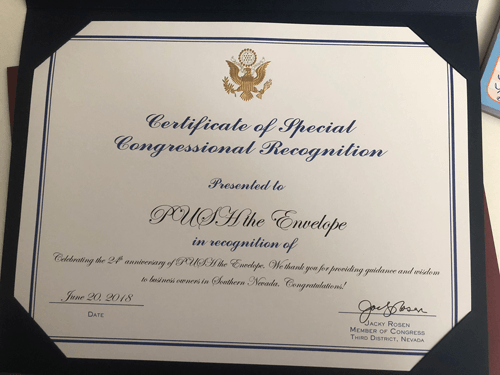 After joining the Henderson Chamber of Commerce, PUSH the Envelope™ celebrated 24 years in business with a ribbon-cutting ceremony. 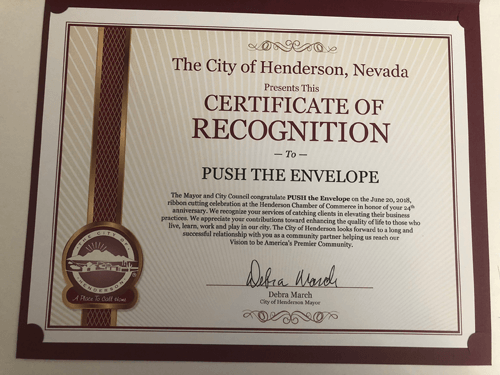 On June 20, 2018, we were welcomed to the Henderson Chamber of Commerce and to the City of Henderson. We are proud to have been in business for over 24 years, proud and honored to serve the people and businesses of Clark County, and thrilled to now be part of the growing and vibrant Henderson community and Henderson Chamber of Commerce as we look forward to our next 24 years.